We don’t know who took this picture or when. 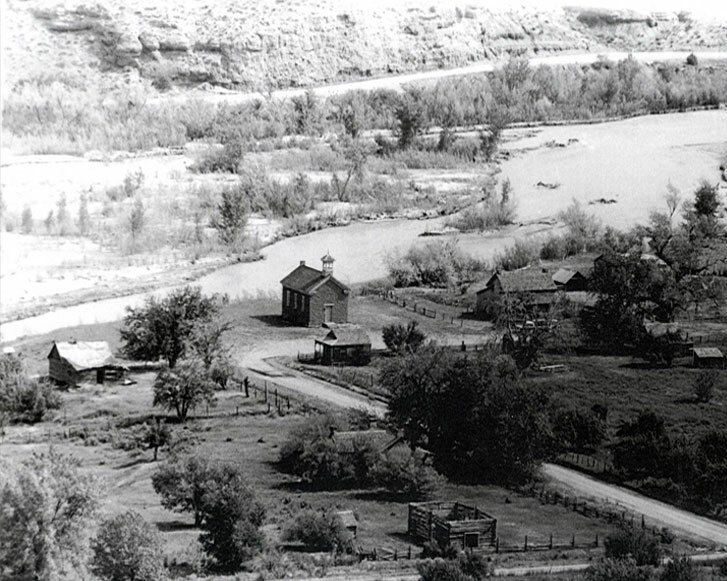 The highway was not improved and the house built during the Butch Cassidy film in 1969 was still there. Look at the Wood’s log barn with no roof that has been restored by the Attiyeh Foundation. The river in front of Grafton is much deeper now. The north adobe chimney of the Russell Home eroded away in a storm. The chimney was replaced with one built using fired brick. The seal between the new fired brick chimney and where it met the adobe inside wasn’t tight and still leaked. The chimney was resealed and it no longer leaks. Behind the Russell Home there was big pile of wood from the reconstruction in 2000. All of the good wood was saved and piled neatly out of sight. The wood that could not be used again was removed. There was a tree growing in the north wall of the Russell Home that we have tried to kill in various ways for years. We dug it up and hopefully it will not come back. We put screens on the wood foundation openings of the Russell Home and schoolhouse to prevent animals from getting in so easily. They do burrow into the dirt as well and we keep filling the holes in. Our 175 acre project area is located on the river across from the Grafton town site. Many partnering agencies, landowners and groups are planning to take out Russian olive trees and tamarisk and replant with native willows to improve wildlife habitat along the river from Zion National Park to the Town of Virgin. We received a $24,000 grant from US Fish & Wildlife Service for our Virgin River restoration project. In addition we received $30,000 grant from the Natural Resources Conservation Service (NRCS). Then we paid the Utah Division of Natural Resources $54,000 for the removal of tamarisk and Russian olive trees from half of our property. Next year they will do the other half. Some of piles of trees could not be burned this year and will have to be burned in the fall. If you’re interested in having your property cleared and replanted there is grant money available, call Curtis Roundy NRCS at 435-691-0289, or email him at curtis.roundy@ut.usda.gov. State Stone from Salt Lake City installed the new cemetery stones. Headstone replacements included a large Gibson white stone that was broken in half, two Gibson name plaques, and four Indian name plaques. All of these graves date back to late 1800s. Due to increase in mountain bike use, trails created behind and above the cemetery were making large gullies in the cemetery that caused erosion. The water needed to be redirected so it drained properly to reduce erosion. Pathways were made to help the drainage and the extra dirt piled on four grave mounds. The wire fence was fixed around the cemetery and the posts were bolstered. The tumble weeds were removed along and behind the fence to give a better appearance. The Town of Springdale will hold the Butch Cassidy 10K Race on Saturday, November 8, 2014. The race follows a beautiful course through fall colors along the Virgin River from Springdale to Grafton. Part of the proceeds from this event benefits the Grafton Heritage Partnership. We want to thank the Town of Springdale and all of the volunteers who year after year make it all possible. More information and registration is at: http://www.springdaletown.com/events/butch-cassidy-10K-race/. 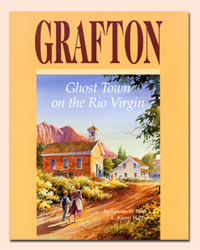 The annual Grafton Reunion, will be held on September 27, 2014 in the shade of the cottonwood trees at the Grafton town site from 12-2:00 PM. Bring your lunch, hat, chair and memories to share. The Grafton Heritage Partnership Project will have items available such as books, pictures of Grafton and t-shirts. There will be a program and if you have any stories you would like to tell about Grafton or a song to sing, let us know and we will put you on the program. (phone 435-635-2133) Everyone is welcome.